Groundnut Chikki is appreciated for its natural goodness of groundnuts. Besides, these chikkis has positive impact on health due to its high nutritive value. These do not have any preservatives, colors and other impurities and thus are completely pure and hygienic. Kids just love to have it anytime they get the chance to eat. It is available in various price ranges for the convenience of our customers. Groundnut Chikki is a healthy, delicious traditional Indian candy made of peanuts and jaggery. Groundnut chikki has no artificial flavors, it is natural. Groundnut chikki is good for health because of the proteins in the peanuts and the iron in the jaggery. These chikkis are appreciated for its unique taste, crispness, distinct shapes and purity. Groundnut Chikki can be eaten alone and perfect replacement of chocolates. A low diabetic patient can swallow this whenever required. Chikki Recharges your body glucose and increases energy instantly. Hence some doctors recommends to have little chikki in daily life. It is a perfect to munch for evening snacks instead of junk food like chips and crackers. 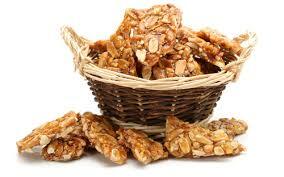 Groundnut chikki is good for kids to snack on these healthy candies which provide nutrition and also fill the stomach. Chikki treat can also be given during joyful occasions like Birthdays, Marriage Anniversaries, Meetings, Festivals etc. Parents / guardians are advised to feed chikki bites to their children without any fear. It is not harmful to body and teeth, no side effects. Just a piece of Chikki per day provides enough recommended levels of phenolic anti-oxidants, minerals, vitamins, and protein. Entire family can have chikki in their daily life. Such an easy and tasty way to stay healthy!